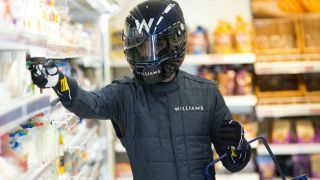 Williams Advanced Engineering, part of the Formula One team, has announced that it's partnering with a startup called Aerofoil Energy to stop cold air leaking out of fridges and into the aisles of supermarkets. A big chunk of supermarket operating costs is in refrigeration, especially when the fridges have no doors and sit open. Williams estimates that supermarkets and convenience stores account for between five and 10 percent of the UK's energy use, with 60 to 70 percent of that energy used in refrigeration. So they've built an aerofoil system, tested using fluid dynamics models and in their F1 factory. It attaches directly onto fridge shelves to redirect airflow and keep the cold confined to the desired area - lowering energy use. Williams says that early testing showed savings of between 18 and 42 percent, though the details of how the experiments were conducted hasn't been released. The next step is to roll it on among retailers - including the UK's second-largest supermarket chain, Sainsbury's. "Aerofoils help the airflow around Formula One cars and can improve their performance -- and that's exactly how they help the fridges in our stores, by keeping the cold air in," said Sainsbury's head of refrigeration John Skelton.